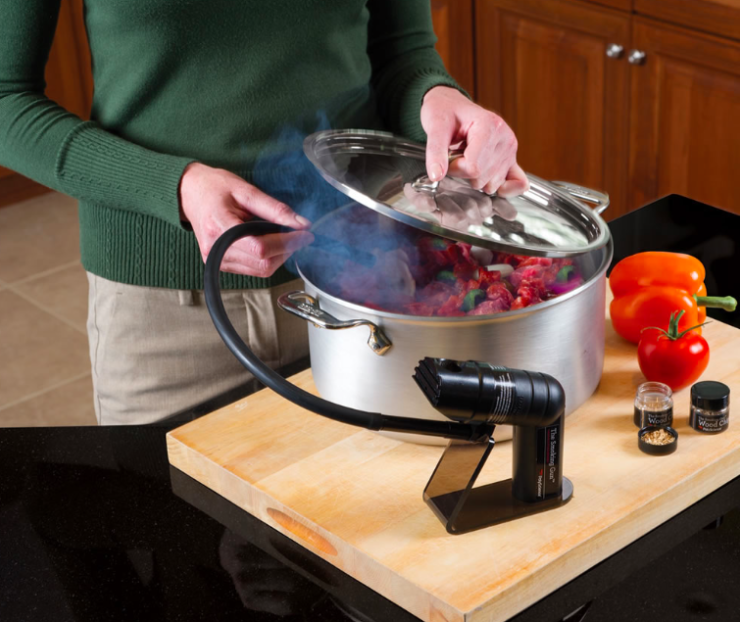 This Is A Handheld Food Smoker | OhGizmo! By David Ponce on 07/22/14 • Leave a comment! BBQ traditionalists will probably have a fit at the sight of the Handheld Food Smoker, but having had the chance to try a meal prepared with a similar contraption, we’d like to tell them to keep a open mind. Clearly you won’t be making any fall-off-the-bone ribs with this smoke, seeing as it’s cold. But you will be able to infuse a bit of a smoky flavour into some meals, just as they’re about to be served. The device holds smouldering wood shavings, the smoke from which is blown through a tube thanks to its internal fan. If you get a little dome to go over your plate, you can fill it up with smoke and serve it like that to your guests. They’ll be delighted as they pull the dome off and the smoke spills out, while the food will pick up a tiny bit of the scent. How much flavour it actually picks up, however, really depends on the type of food being served; in our experience, we noticed that leafy greens absorb it a lot while the salmon tartare they were mixed with ended up tasting just like salmon.